" Blake - over the top "
Date & start time: Saturday 5th March 2016, 12.15 pm start. 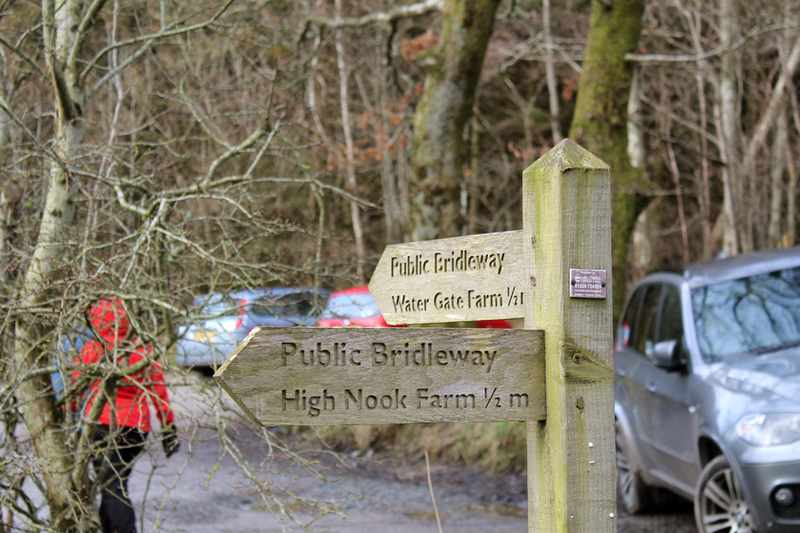 Places visited : Leaps Beck Valley, Low Pen, High Pen, Blake, High Nook Tarn, Maggie's Bridge. 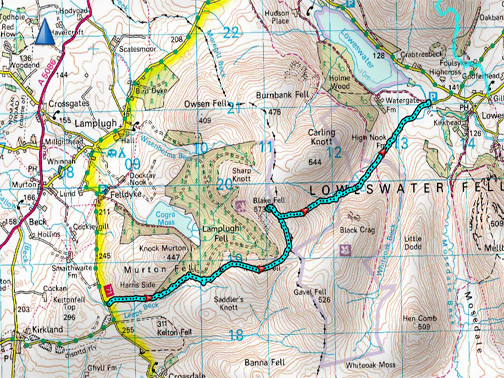 Walk details : 4.7 mls, 1275 feet of ascent, (1700 descent) 3.5 hours including lunch. 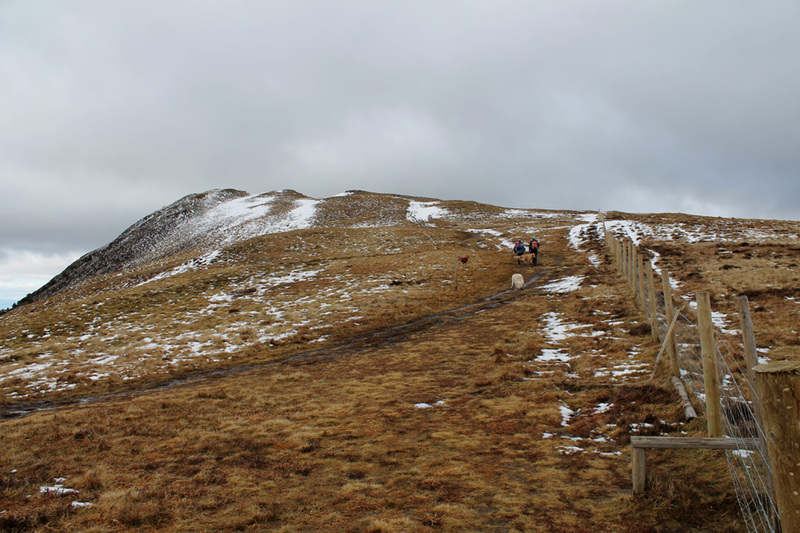 Highest point : Blake Fell 1,878ft - 573m. 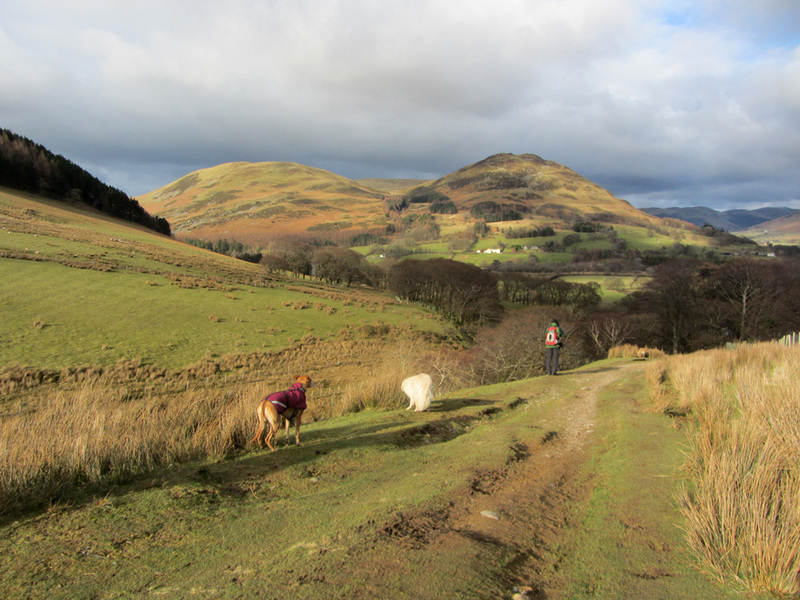 Walked with : Ann, Jo and our dogs, Harry, Dylan and Amber. Weather : Overcast. 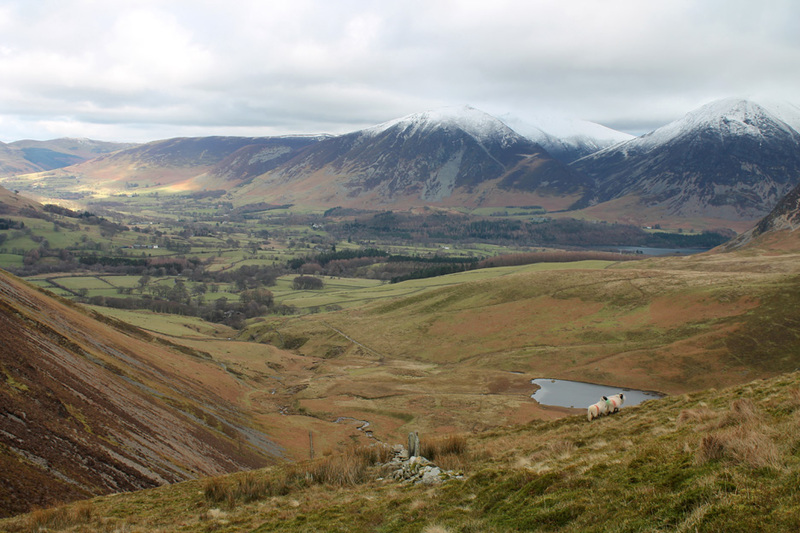 Cloud on the high fells but with the prospect of sun. Cold NE wind. from the road below Knock Murton over the top to home. We'll fetch the other car later. Finding a parking spot on the fell road was a little tight . . . but there's room for six or more if everyone parks sensibly. My companions for today . . . Jo and Ann. 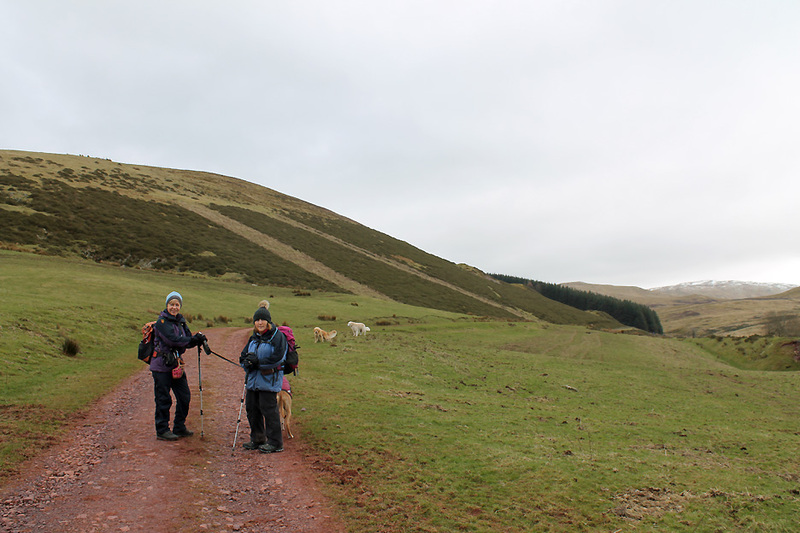 We'll set off along the red track below Knock Murton. It's red from the iron in the soil. . . not a new path colour for the mapping people ! Jo didn't realise the industrial history of the area. 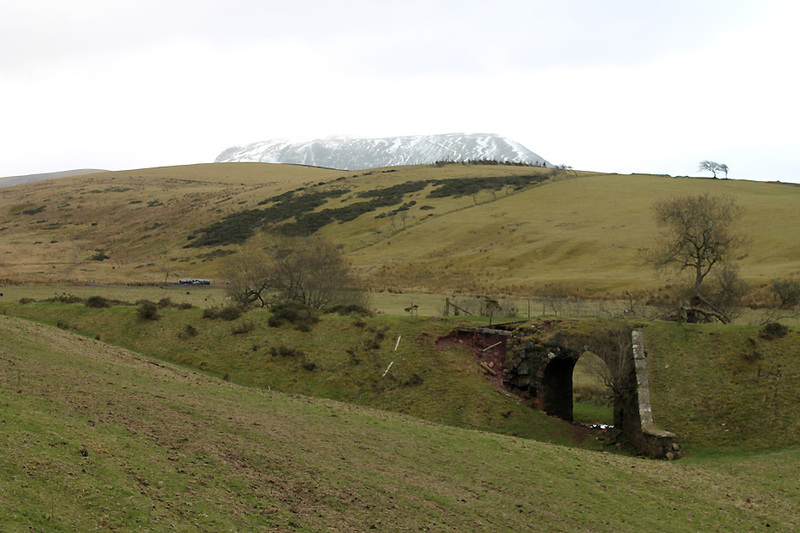 There are several significant iron mines driven into Knock Murton which would have been served by this old rail track. The gate at the entrance to Cogra Moss Woods. We had two options, in or out of the trees. They both end up at the same place. We took the high road to the left. As you clear the trees at the other end we get a first view of Blake summit. Technically we double back here (extra 50 yards compare to the other track) then took the path up towards Pen (seen above the tree line). 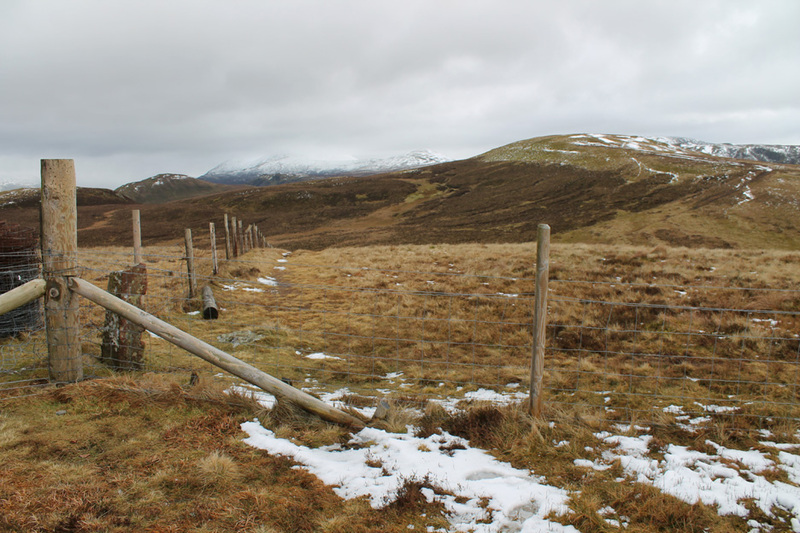 Following the new fence line up the fell. 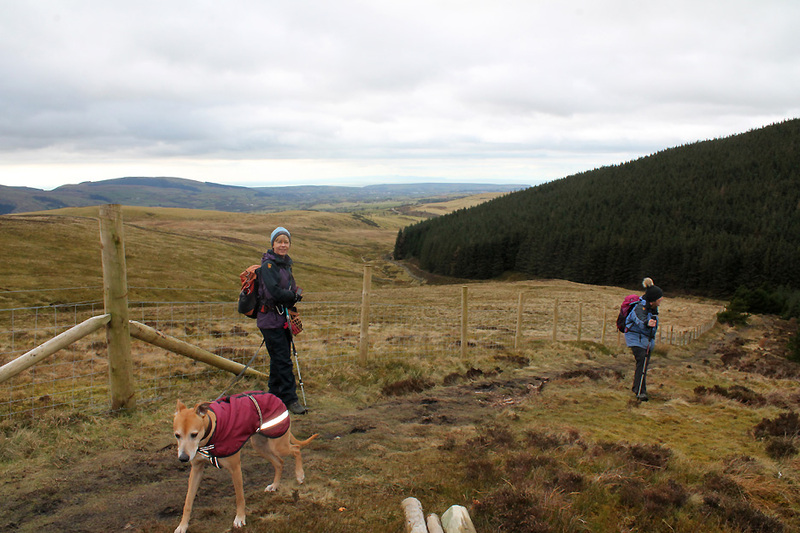 Looking back we can see our outward route and a lovely clear views across to the Isle of the Isle of Man. 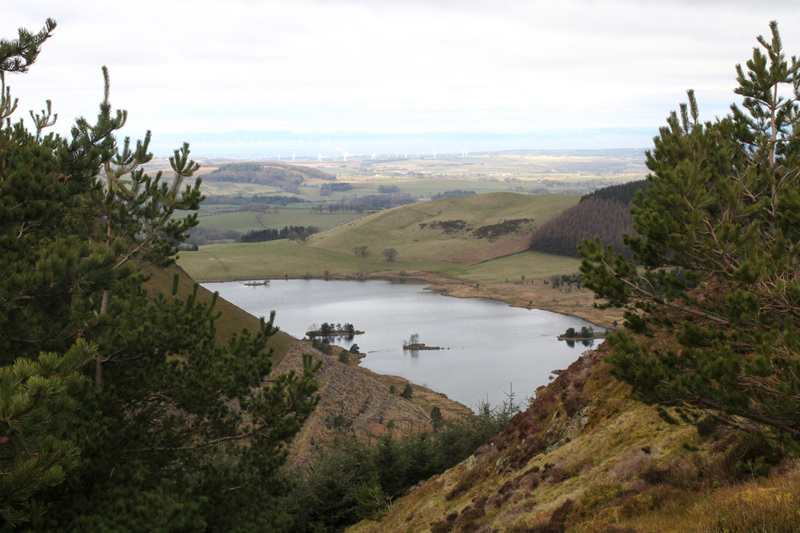 Through the ever widening gaps between the trees we look down on Cogra Moss reservoir. 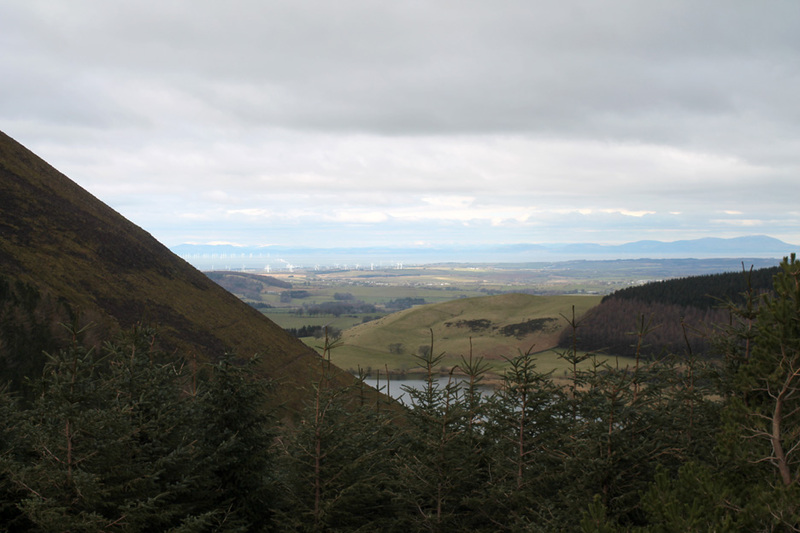 and the views across to Criffel are clear enough to make out individual fields on the other side of the Solway Firth. 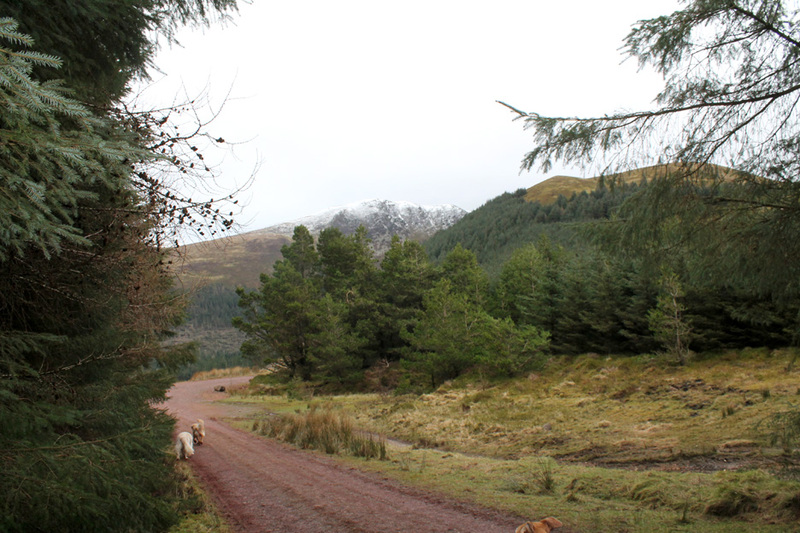 Knock Murton, the forestry on the western side hiding some of the scars of the old iron mining. 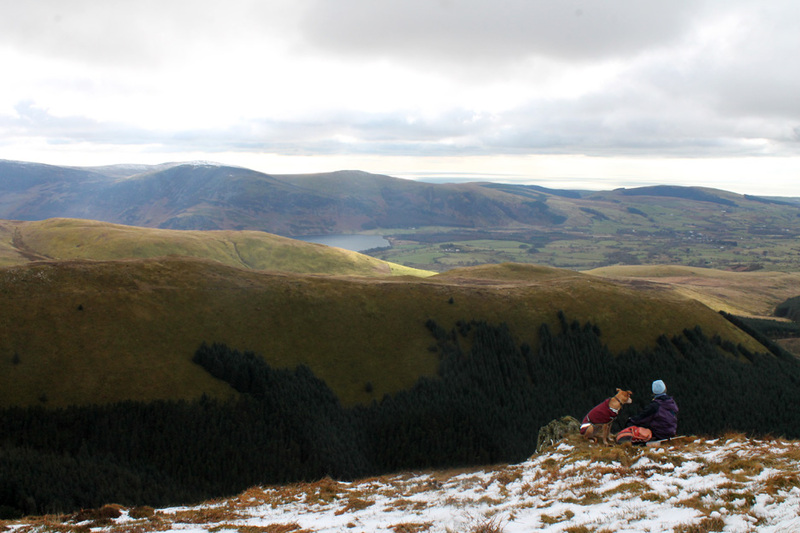 The summit of Low Pen is recorded for posterity whilst the dogs sit quietly for a moment. As we pass High Pen we have a closer look at Blake. There are two very clear sheep tracks across the face of the fell, almost too big to be purely for the animals. 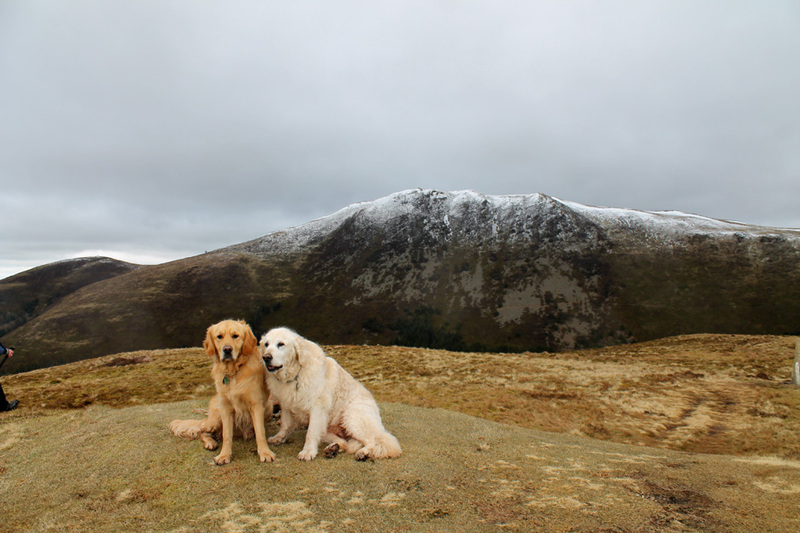 Why restrict panoramas to the highest summits . . . try this one from the intermediate summit of High Pen. The path up from White Oak Moss meets ours at the old sandstone boundary post, now over-shadowed by the modern fence. The final pull to the top . . . and more snow up here. 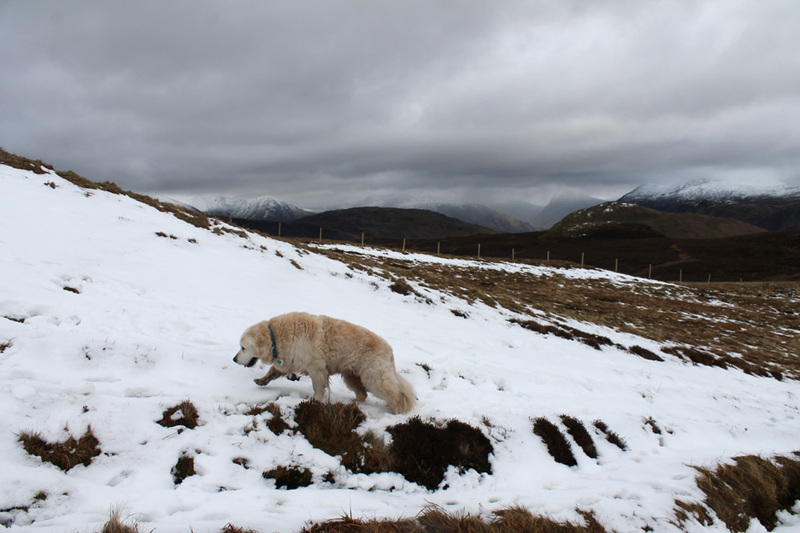 Harry tries out his in-built crampons. 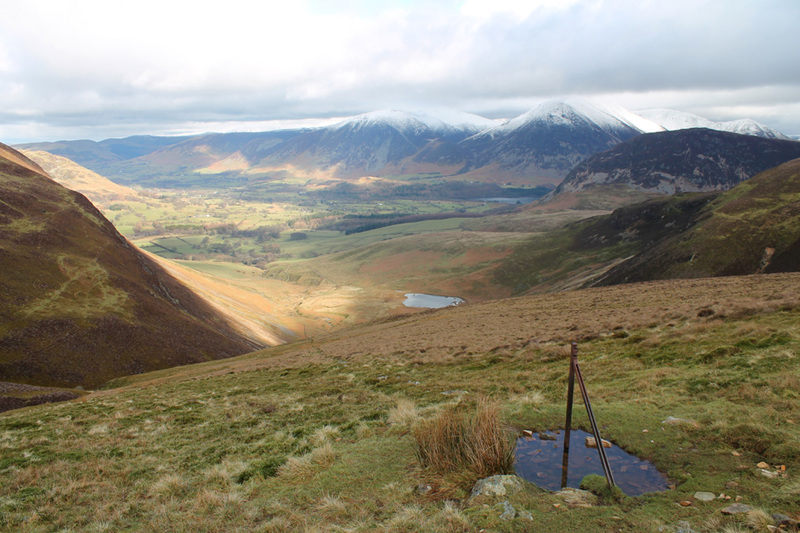 Looking back at the High Stile Ridge and distant Buttermere to the left. The summit in sight after the long, fairly gradual climb. To the right is sunshine on the northern Solway and Cockermouth. False summit ? . . . this is the real one just a short distance beyond. 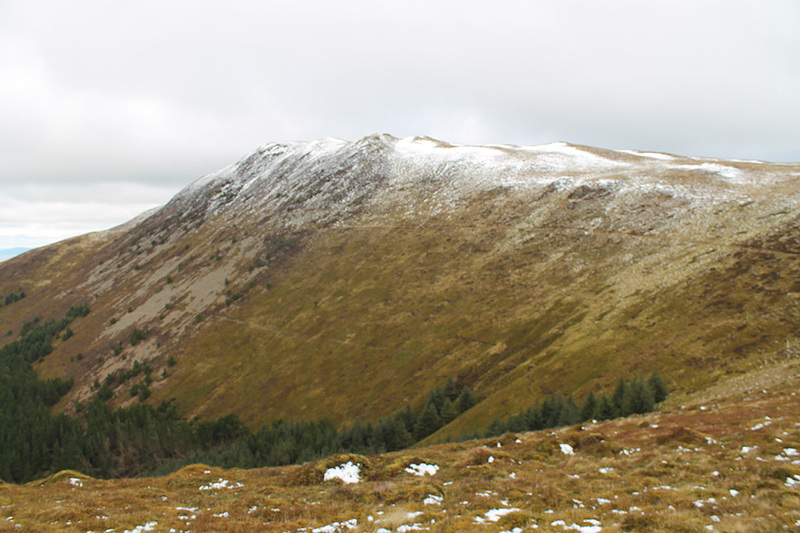 We can see the summit shelter now and two folk sitting alongside it. To the left this time . . . the Galloway coast of Scotland over St Bees Head. We exchanged greetings as the other couple left and took a photo from where they sat at the shelter. 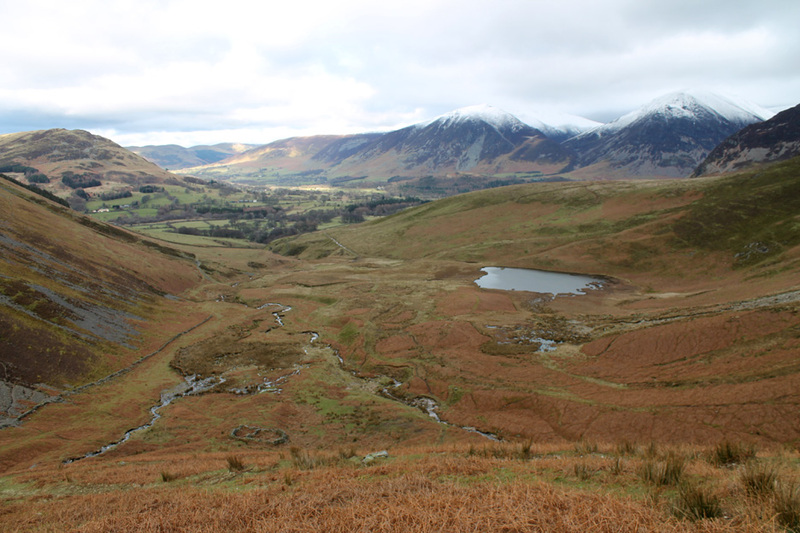 As I take the photo, the strong, cold north easterly whistles over from Whiteside and Grasmoor. No wonder they sat on the outside, the wind was blowing straight into the shelter through the open doorway. 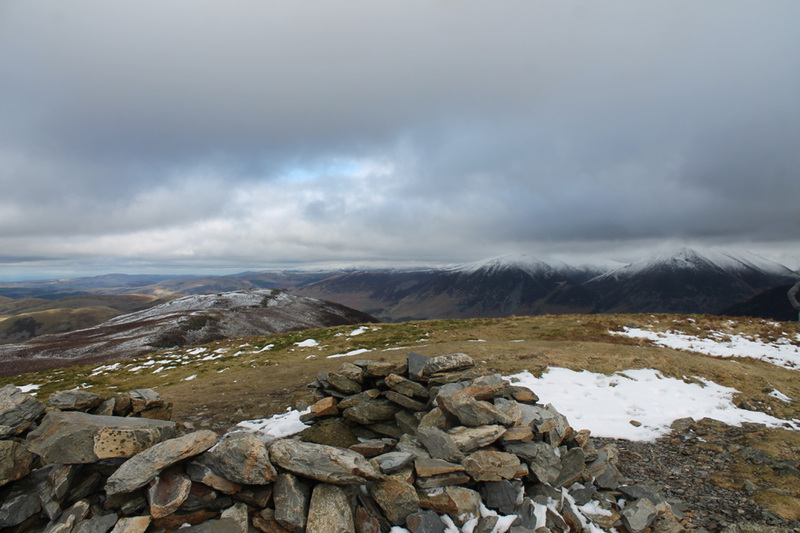 of the view from the highest point of Blake Fell. Did it catch your eye in the panorama ? 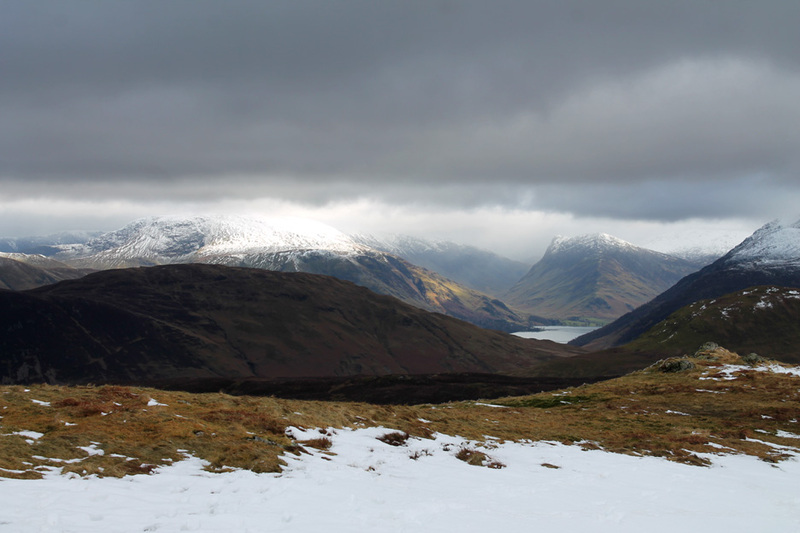 There was a bright shaft of sunlight beaming down on Robinson and Fleetwith Pike, shown better with the big lens. It looks like Jo has found a more sheltered place and a rock to sit on for lunch. It is a cold, wild place to come for a picnic . . . but we've brought a thermos today so hot packet soup is a nice bonus. 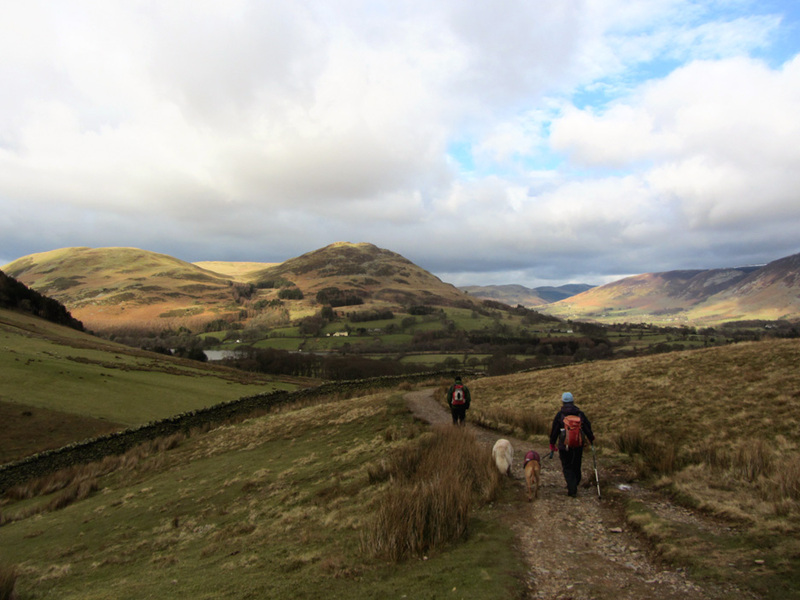 we set off down the other side of the fell towards home. so finding the old fence line is the key to an easier descent. Partway down there are two old stone gateposts. 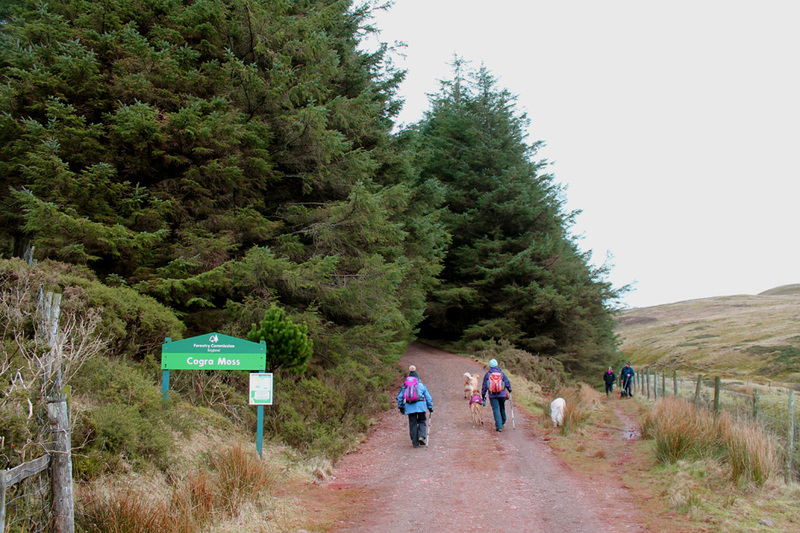 Take the path through the gate and start down the zig-zag path, indistinct at first , then becoming more obvious. As a clue, follow the sheep . . . but bear in mind they may have moved by the time you get there ! Rather too steep to go straight down to the sheepfold now, but the with steeper slope the path becomes more obvious. 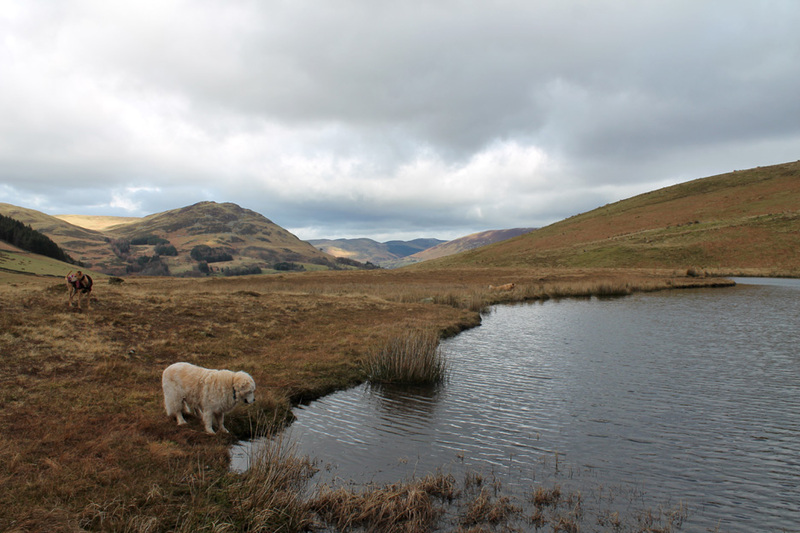 Below is the delightful High Nook Tarn, long separated from the two streams in the valley.
. . . but it is a little to deep at the edge to make getting in and out easy at his age. 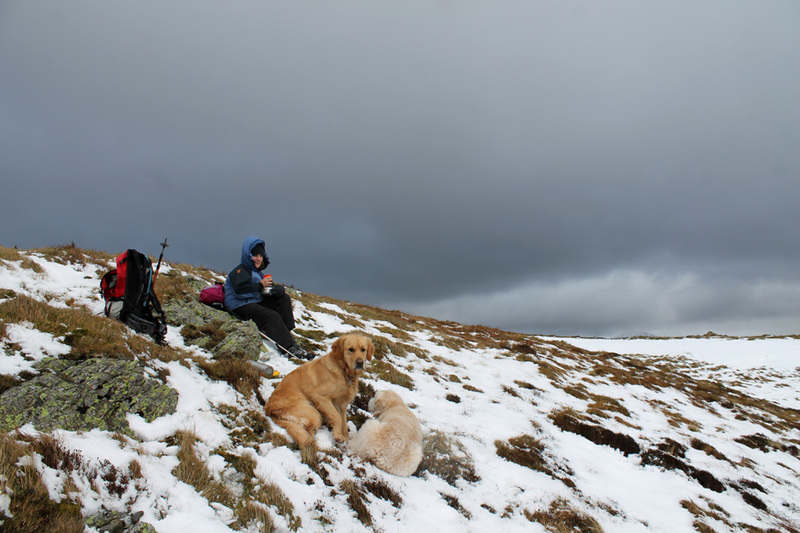 but High Nook Tarn is now hidden behind the slope behind the girls. 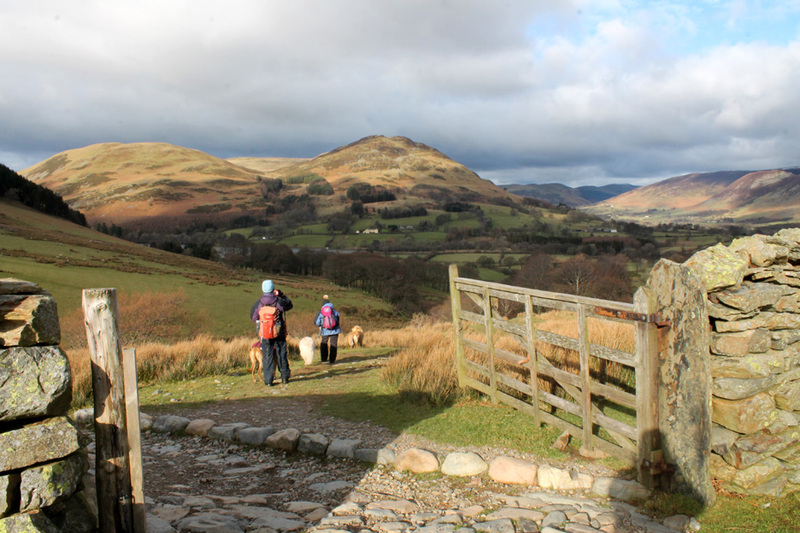 The view forward includes Darling Fell, Low Fell and the Lorton Valley. At long last the sunshine we have been looking at for the last hour has worked its way up the valley to shine on us. 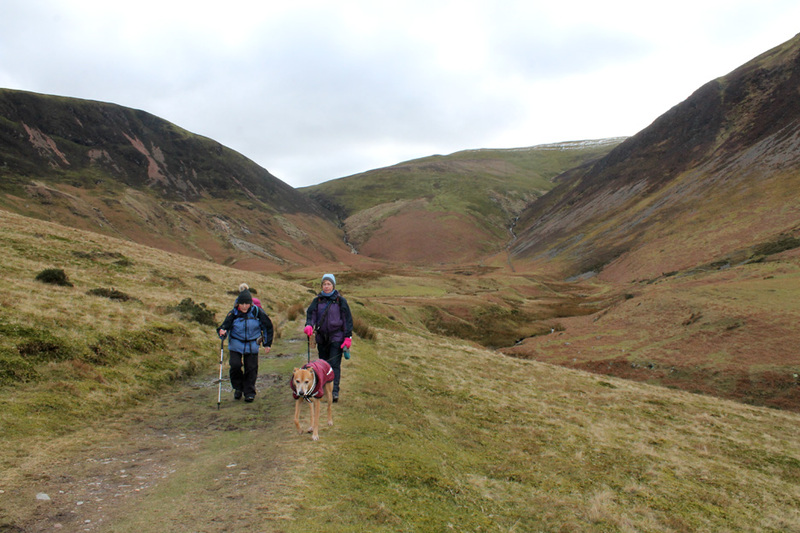 The track down to High Nook Tarn. 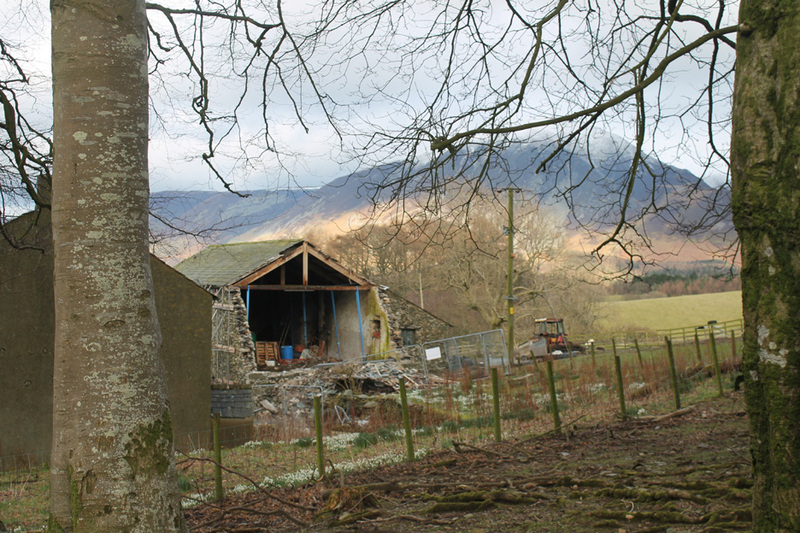 but the National Trust have not gone any further towards rebuilding the old barn. Out in the yard . 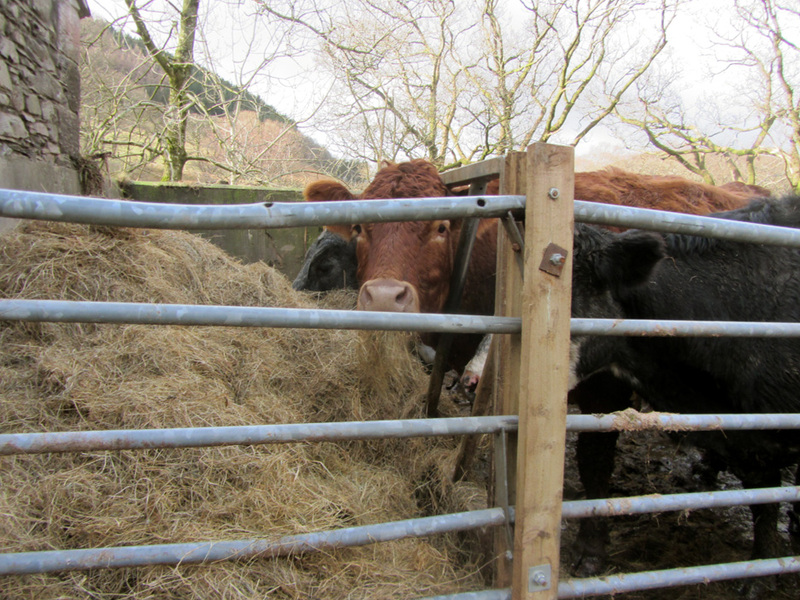 . . the cattle are enjoying winter feed as the ground is too soft to allow them into the fields. 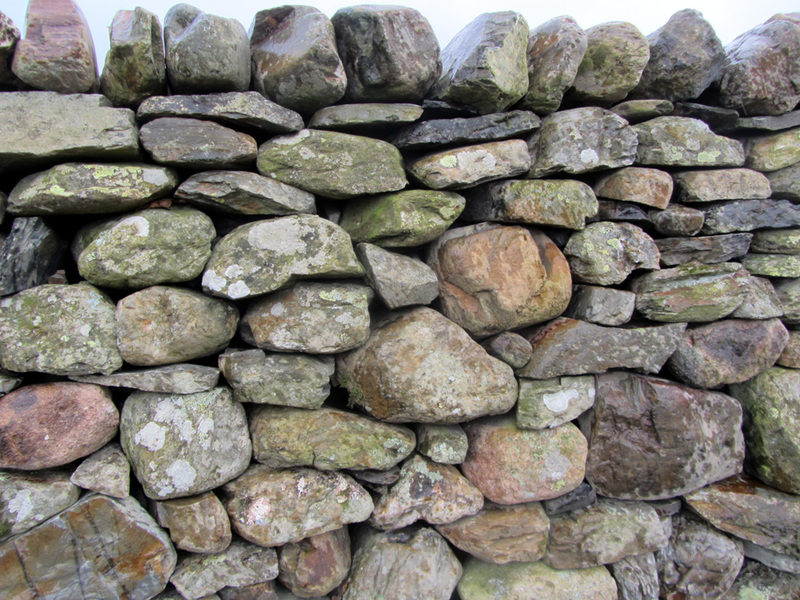 The new wall across the meadow offers an insight into the skill of the dry stone wall builder. No simple flat Lakeland slate, York stone or cut Cotswold sandstone . . . mainly rounded local river-washed boulders. We end the walk slightly short at Maggie's Bridge car park, where we left Jo's car earlier. it just remained to drive back and fetch the other car after a great linear walk across the fells. This site best viewed with . . . a nice big thermos flask.